Prince may not have realized just how much of a revolution he started when he took control of his entire music empire a few years ago. Since then, many of today’s artists have grabbed the reins on the business side of the recording industry. 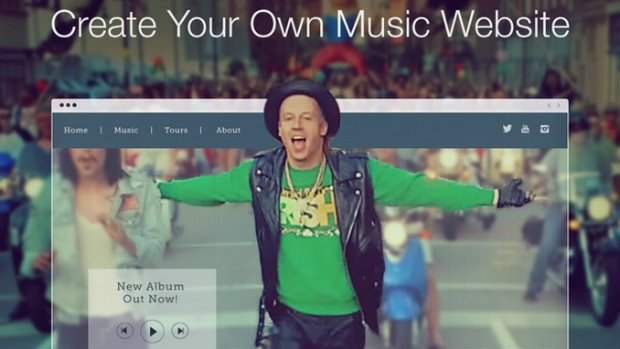 Now you can, too, with the new Wix Music website builder. You have your songs down pat; you just need to get them out to your fans. This new package from the folks at über user-friendly Wix allows artists to be more than just musicians. With Wix Music, they can also be the tour manager, record distributor, and even public relations specialist—almost anything but a roadie. From garage bands to national touring acts to rock festival icons, no band is too small or too big to take advantage of this easy-to-use promotion tool. Plug in the Les Paul and crank it up to 11; you’re about to make it big! Before launching this new product tailored specifically to musicians, if bands wanted an online presence, they would have to modify a traditional business website and try to incorporate some of the capabilities that Wix Music offers. As great as the basic Wix tools are, they still fell short of allowing for a full-featured Web builder for musicians—until now. With Wix Music, you still get the same clean-looking site that you would expect from a Wix webpage, only optimized to put your band in the spotlight. Plus, building a site with Wix is way easier than learning to play the guitar. You don’t have to hire someone to take care of all of the booking details for your upcoming tour. It doesn’t matter if you are playing a couple of shows around town or if you are taking the tour bus out on the road. You can promote your live concerts and sell tickets for upcoming performances through Songkick and BandsInTown. Venues can schedule your appearance and fans can get first dibs on admission. Booking agents contact you directly through your website, eliminating the need for a band manager. Your followers are able to purchase concert tickets on your page, too. Did you know that musicians receive just over two percent for each album that they sell? Divide that by the number of people in the band and it’s easy to see money does not make its way to the artists. The major reason is because of sales and distribution. The record labels have run that racket, until now. With Wix Music, you can sell MP3 and FLAC music files directly through your site without having to pay a commission. Fans can even listen before they purchase your latest release. Plus, you can distribute your music through iTunes, Google Play, Spotify, and over 120 other digital music venues. With the help of Wix Music, you can create electronic press kits (EPKs) to distribute to booking agents, radio stations, record buyers, and label executives around the world. Take your band out of the basement and into the big time. You can even include your contract rider demands so that they know to remove the blue M&Ms and to have your favorite micro-brew on ice backstage after you’re done rocking the house. You can sell t-shirts, concert posters, compact discs, and maybe even some vinyl—commission-free—with Wix’s Ecommerce capabilities. Interact with your fans though email with the help of WixShoutOut. Create newsletters to announce upcoming tours, preview new releases, and promote hot merchandise items. All of your social media accounts can be linked to your band page to keep it simple, too. With the famously user-friendly Wix templates, you can create an amazing looking page with new music-specific themes. Plus, you can analyze site traffic, music sales, social shares, and song downloads—all from your intuitive Wix dashboard. The Wix Music website builder is your ticket to the show. You might not create the next Paisley Park, but you can join the revolution in keeping money-hungry record executives out of your business. Wix gives you the power to do their job. Why pay them when you can pocket the money yourself? That gas tank on the tour bus isn’t going to fill itself. If you don’t already have a Wix page and you’d like to set up one solely to run a Wix music site, the process is simple and straightforward. This will take you to a page showing you a table of contents for the hundreds of templates available for Wix. On the left side of the screen click on “music,” and instantly you’ll be shown some of the dozens of templates specifically designed for musicians. There is a high number of templates to work with, with options suiting all types of music genres from jazz, to hip hop, to country to electronic and classical and beyond. When you find one you like, click “edit” and you’ll be taken to a sign-up page where you can enter your details and receive a Wix music site and start editing. Another method is to go directly to the Wix Music page, click on “get started,” and then fill out your details. Click “view” on any template to get a closer look without committing. When you find one you like, click on “edit” and you will be taken to the Wix website editor, with which you can change the template as you see fit. On left side there is a panel where you can click and begin uploading tracks. Click on “uploads” to choose a single track to upload or a more extensive selection of music. After clicking “single track” you will have the option to add files from your computer directly to the new website. Just select a track and click “upload” and it will be added to the website. Wix will then allow you to edit how the song appears on your website. With the upload option you can also add photos and other media and visuals to highlight your music. On the bottom of the left side panel you will see the option to add a blog to the site. This is a great place to add posts describing your music, lyrics, and to form your voice and identity as a musician. You should then save your website and you'll be given the option to chose a name - you can take a free wix address or pay for a premium plan that will let you pick your own domain name instead of the longer, unattractive ones that come with wix free packages. Beginning with the combo package ($8.50 a month), Wix will remove the company’s ads from your site. With a premium plan, your music is made available on more than 120 music streaming websites, including Spotify and Apple Music. With the VIP and Ecommerce plans (priced at $24.50 and $16.50 a month, respectively) you can also work an online store into your website and sell albums, tracks, and concert tickets directly off the site. Adding Wix Music to a pre-existing Wix site is as easy as can get. You click “Add +” on the left side of the editor and then the option that says “music.” You can then drag the Wix music player to where you want it on your website. If you’d like to add music to your site you first need to create an album, single, or playlist. First download the Wix Music app from the Wix store. The app has a free version that allows visitors to play, download, and purchase your music directly from the website, but with the premium version (beginning at $4.08) you also receive digital distribution and the ability to sell your merch. From the Wix editor, click on the Wix Music app and then “manage your music” to access the music manager. Alternately, on the site’s dashboard you can just hover over the Wix Music app and click manage your music. Click “add music,” “create album,” and then enter the album details as you see fit, including the album name, album version, artist name, record label, and genre. You can then click album cover and select an image to upload and click apply. If you want you can set up a release date for the album by clicking on the calendar icon. You can then select a currency for the album and tracks and determine the album download options, including the price. Once you’ve created the album you can begin adding tracks to it. Click add music, and then create single. Fill in all the details much like with uploading an album. The same principle applies with creating a playlist. You can upload up to 500 tracks, though fans can’t download the entire playlist as a whole. You can upgrade to the Wix Music premium version at any time by clicking on the upgrade icon in the Wix Music player, and then selecting the plan that suits you. From the Wix dashboard, you go to the Wix Music app and click manage your music and then upgrade in the music manager and pick the plan that you want. There are five premium music plans offered by Wix. With all five plans you receive commission free sales on all of your downloaded music, though with each subsequent plan you get more storage, the ability to distribute more albums and singles, as well as access to more distribution channels (like iTunes, Spotify, Apple Music), as well as email marketing plans.